Leslie teaches adult hoopdance classes in the Herndon/Reston/Northern Virginia area. 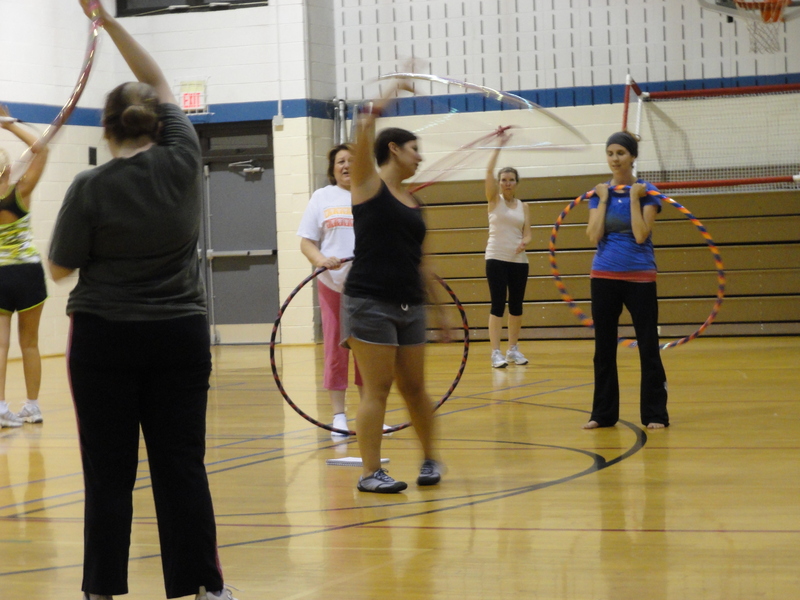 Her next hoopdance sessions begin Sept. 13, 2015 (Sunday mornings, 11 a.m. to noon, 12 week session) and Sept. 17, 2015 (Thursday evenings, 6:45-7:45 p.m., 12 week session) at the Herndon Community Center, located at 814 Ferndale Ave., Herndon, VA. The cost depends on if you’re an in-town or out-of-town resident but is around $75-$100 for the full session of 12 classes. For more information about classes or private lessons send an email to leslie at tillywhirls dot com. Private lessons start at $40 per hour for one person. Pricing fluctuates depending on the size of your group, but can cost as little as $6 per person with a maximum group size of 25. If you’re interested in bringing hoopdance classes to your gym or community center, feel free to contact Leslie. To see video of what a hoop class looks like, click here. Leslie is the organizer of the NoVA Spinners Hoopdance and Flow Arts Meetup group where she posts information and dates on local hoop jams in the Herndon/Reston area, as well as classes, and other great opportunities for Northern Virginia hoopers to get together and spin. 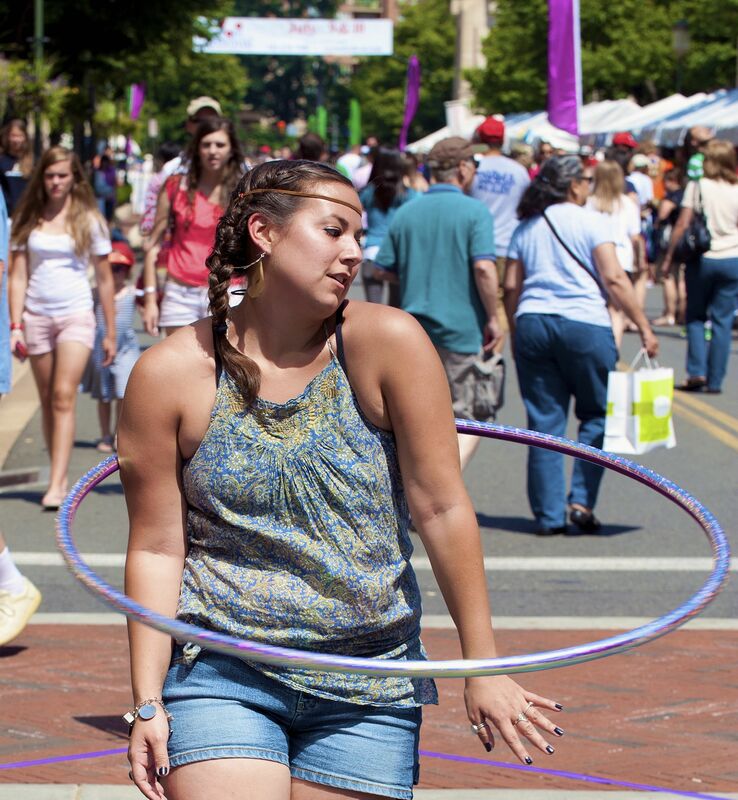 For example, Leslie likes to bring her hoops to local festivals such as Herndon Festival, NoVA Brewfest, the Herndon Labor Day Wine Festival, and more and she’d love for other hoopers to join in. Hoop jams are events where hoopers gather, often in a public park, to spin together, learn from each other and bliss out under the sun or stars to some music. Hoop jams will likely be held in the Herndon/Reston vicinity. They are for all ages and ability. They are not meant to be classes or lessons, but a time for hoopers to get together to share, practice and have a good time. It’s not uncommon for hoopers to share tricks and tips on moves at jams, but be mindful that some hoopers may be there to practice only and not teach. Visit or join the NoVA Spinners Hoopdance and Flow Arts Meetup page here. From bachelorette parties to block parties to a simple girlfriends’ get together, hoopdancing is a fun way to get everyone moving and grooving. Parties can include a 5-15 minute performance/demonstration and a 45-50 minute lesson, or just a full hour of instruction. If elected, Leslie can make hoops for participants to keep. If it’s at night time, or in a location that can be darkened, the performance portion can be done with an LED/glow hoop. Parties start at $150 for the first hour and $50 for each additional hour. Contact for pricing if you’d like hoops for participants (or just the birthday person) to keep. Hoopdance performances can help bring something fun, new and exciting to your event! If you’re looking entertainment at a wedding, corporate event, or concert, street performances at festivals, fundraisers, busking, etc., hooping could add the perfect energy. Leslie can create a custom show for your event based on the event theme, company colors or other personalization. Performances can include day hoops (non-glow), LED glow hoops or fire hoops. Each performance is different, so Leslie will work with you to tailor the right performance for your event. Performance rates depend on the event requirements. Email leslie at tillywhirls dot com for a quote and more information. Additionally, Leslie is available to do demos at local events such as health fairs that can include short performances or hoop demonstrations along with a mini hooping lesson. NOTE: Leslie has taken a number of hoopdance courses (some with certifications), including Hoopnotica’s Hoopdance 1, Hoopdance 2 and HoopnoticaFit, Body Hoops children’s program and FXP Hula Hoop, which is a new workout based in hooping, pilates and barre work. She has also participated in a number of workshops taught by professional and circus-trained hoop performers. Leslie carries her own insurance as a fitness instructor and performer, and has a background in dance, including jazz, hip-hop, tap, ballet and modern. Tilly Whirls street performing in the 70s area at the 2011 Reston Festival.